The role of Digital Video Marketer is very important nowadays. As Social Media is thriving the use of video, every media organisation need a solid, experienced Digital Video Marketer with in-depth knowledge of latest happening concerning digital video industry. 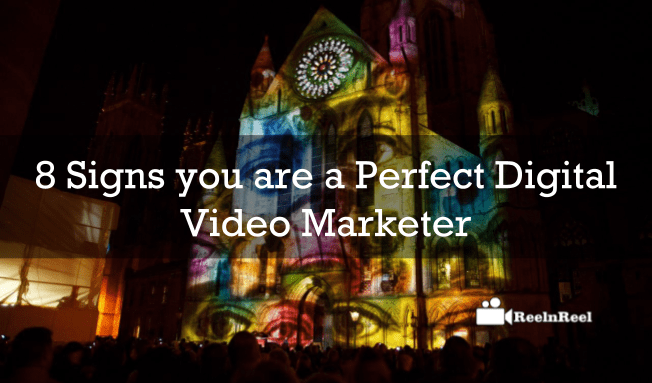 Here are the perfect signs saying you are the true Digital Video Marketer. A perfect Digital Video Marketer will understand digital video content and the metadata in it. Also, work on refining parts of that content. He can suggest changes and give ideas to the production team on how to get the best output. Digital Video Marketer can plan and research suitable video platforms for the content produced by the brand or organization. He can repackage and make it suitable for the different platforms for distribution. Digital Video Marketer can play with large datasets which are containing video metadata. They can have the ability to define and set goals using large big datasets. Digital Video Marketer can check real-time as well as daily, weekly, monthly video analytics reports. He would be able to get any stats and reports on the product and provide it to the higher authorities. He can analyse existing previous analytics and correlate to current analytics, and he can easily find the gaps in the content, and he can plan future content based on the reports and analysis. He can easily predict the content loopholes and sort out the process in the best way. Digital Video Marketer can have a complete understanding of content trends based on the daily happening. He can even predict future trends like what type of digital content we need to generate in the coming days based on upcoming trends and forecasts. He can gather multiple trends data using tools as well as from Social Media Platforms. He can only work on ROI factors rather than work for reach and branding. He calculates budgets, spending and the output from it. He creates or plans long-term and short-term goals for the overall productivity. He has an ability to monitor every in and out activity of the digital video production to launch process with keen activity tracking methodologies and tools. He can create and launch digital video campaigns on multiple social media platforms and he can manage any kind of advertising campaign with complete result oriented process and strategies. If a Digital Video Marketer can smartly working and adopting above skills then he is a perfect suite for your brand or organization. Let’s test you, marketer, whether he is doing all above tasks for better ROI.